Lessons learned from She Will Reign’s last start defeat have trainer Gary Portelli quietly confident the star filly can return to her best form at Royal Randwick on Saturday. Portelli revealed the 2017 Golden Slipper winner has changed shape in the past 12 months and requires a different approach in her races. And they learned that the hard way when she ran eighth in the William Reid Stakes in Melbourne three weeks ago. “At Moonee Valley we rode to suit the race and not herself. She was never comfortable,’’ Portelli said. “They were scorching out in front and the winner came from second last. Had she been back with the winner does she run on strongly like she did when she won the Moir? We’ll never know. That message is something Portelli remembers champion jockey Glen Boss telling him after a defeat on his former star Rebel Dane. Boss returned to tell Portelli he rode the horse too close and he didn’t run on so wanted to ride him a couple of lengths further back in his next start, the Group 1 Rupert Clarke Stakes which he duly won. “I’m hoping Ben (Melham) will take a leaf out of that book,’’ Portelli said. Portelli is rapt with how the filly has returned from Melbourne and when she steps out against her own age in the Group 2 $600,000 Arrowfield Sprint (1200m) don’t be surprised if there’s a form reversal. Four of her five runs as a three-year-old have been against older horses and her three defeats have come in the Everest, the Oakleigh Plate and the William Reid. While there’s some unknowns when a horse comes off a bad run he said he can see no excuses on paper. It’s a strong edition of the Arrowfield and She Will Reign is a $13 chance with TAB. 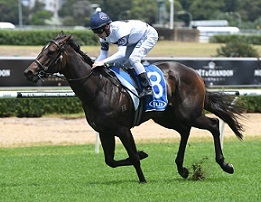 She Will Reign worked on Wednesday over 800m at Warwick Farm in about 50 seconds and will have a final gallop on Saturday morning over 800m in an easier 54 seconds. “She’s a different shape. When she was in the Slipper she was short and compact but now she’s longer and leaner,’’ Portelli said. That theory won’t be tested until next season and Portelli confirmed She Will Reign will race on at four. “I’ve said to the owners all the way along the best sprinters in Australia come good when they are four and five,’’ he said.